How much do Suns suites cost? Prices typically range from $3,000 -$5,000 for Phoenix Suns suites. Prices vary based on day of game, opponent, and the location of the suite. The better the opponent the more expensive a Suns suite will be. 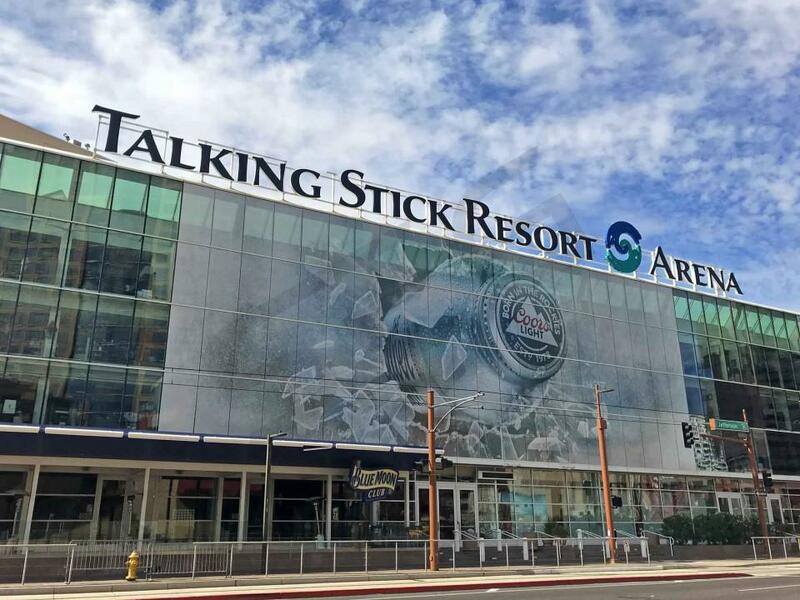 Luxury suite prices for concerts and other events at the Talking Stick Resort Arena (Formerly US Airways Center) can vary widely based on the type of event. 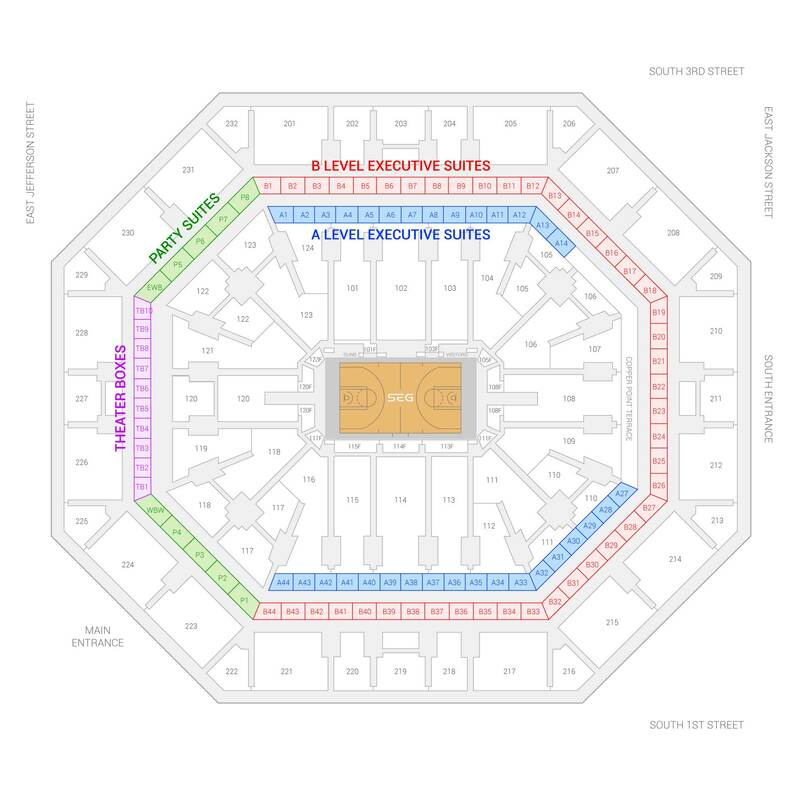 A Level Executive Suites at Talking Stick Resort Arena are located on the lowest suite level, making them the closest to the court. A Level suites feature upscale amenities and comfortable seating options for your guests. Talking Stick Resort Arena A Level suite tickets include access to the arena and access to exclusive stadium clubs like the Club Annexus. A Talking Stick Resort Arena B Level private luxury suite includes 12 tickets with an option to purchase up to 10 additional suite tickets. With your suite you will receive VIP parking, private entry into the arena and exclusive access to Club Annexus. A Talking Stick Resort Arena luxury box features in-suite catering options, wet bar, HDTVs, private restroom, interior lounge chairs, exterior theater-style seats, a dedicated suite attendant and room for entertaining. There is a new wave of excitement surrounding the Phoenix Suns this year. With new head coach Igor Kokoskov, first overall pick DeAndre Ayton, and star player Devin Booker locked up long term, a bright future is coming together in Phoenix. Devin Booker has quickly emerged as one of the best players in the NBA. Despite being just 22 years old, Booker has such a natural scoring ability and smooth shooting stroke. His progress has been remarkable, and Booker is now ready to take the next step as the leader of this team. After signing a 5-year, $158 million extension in the summer, Devin Booker is a Phoenix Sun for the long haul. First overall pick DeAndre Ayton has fans buzzing in the desert. At 7-1, Ayton is a physical beast who knows how to use his size around the rim. He dominates the paint on offense, defense, and on the glass. With Booker and Ayton in Phoenix for the foreseeable future, there are plenty of reasons to be excited about the future of this team. Josh Jackson is the third piece to the puzzle that the Suns hope can turn into a star. Jackson’s rookie performance may have gotten overshadowed by other rookies, but he still enjoyed a tremendous year in which he showed a ton of potential. Jackson showed flashes of his elite defensive skill, in addition to averaging over 13 points per game. The Suns were aggressive in the off-season in their attempt to add versatile veterans to the roster. Trevor Ariza signed with the team on a 1-year, $15 million deal, bringing a strong veteran presence to the locker room. Coming over from the Houston Rockets, Ariza is a plus defender who can space the floor on offense. Players like T.J. Warren, Ryan Anderson, Tyler Ulis, and Mikal Bridges will likely get some time in the rotation to support the core players. Warren is an underrated scorer who averaged nearly 20 points per game last year - expect T.J. Warren to gain the attention of pundits around the league in 2018-19. Watching a Phoenix Suns game from a luxury suite at Talking Stick Resort Arena is a bucket list experience. A luxury suite is the perfect environment to host a client event or celebrate with friends and family. A Talking Stick Resort Arena luxury suite comes with HDTV's, luxurious furnishings, comfortable seating, customizable food options, a private restroom, and a dedicated suite attendant. Luxury box tickets will also give owners entry to the stadium through exclusive entrances and access to private clubs in the arena. The Phoenix Suns have three of the most exciting guards in the NBA in Devin Booker, Eric Bledsoe, and Brandon Knight. Booker burst onto the scene as a rookie last season averaging 13.8 points per game, 2.5 rebounds per game and 2.6 assists per game. The Kentucky product’s shooting and ball-handling skills earned him a spot on the All-Rookie team. Eric Bledsoe is an athletic guard that has learned to harness his speed and strength; he's a highlight reel player with a flare for fast breaks and dunks. Brandon Knight is another high-scoring guard on this Phoenix team. Knight is an elite shooter in the same tier as Stephen Curry or Damian Lillard. To compliment their three dynamic guards, the Suns have 7’ 1” center Alex Len out of Maryland. Len has developed into a very well-rounded player with a respectable jump shot and a great feel for the game. In the offseason, the Suns brought back a couple of fan-favorites in forward Jared Dudley and guard Leandro Barbosa. Dudley is a sweet-shooting forward who will bring playoff experience and veteran leadership to a very young team. Barbosa, the “Brazilian Blur”, is an extremely fast guard who had his best years with the Suns from ‘03-‘10. In the draft, the Suns acquired Kentucky point guard Tyler Ulis, Croatian big man Dragan Bender, and Washington Huskies power forward Marquese Chriss. With all the young talent on this team, it should be an exciting year filled with many high-scoring and fast-paced games. Watching a Suns game from a luxury suite at Talking Stick Resort Arena is a bucket list experience. A luxury suite is the perfect environment to host a client event or celebrate with friends and family. A Phoenix Suns box comes with HDTV's, luxurious furnishings, comfortable seating, customizable food options, a private restroom, and a dedicated suite attendant. Skybox tickets will also give owners entry to the stadium through exclusive entrances and access to private clubs in the arena. Talking Stick Resort Arena will also be hosting special events like Demi Lovato, Nick Jonas and Keith Urban concerts. Thank you for signing up for specials at Talking Stick Resort Arena. Enter your email address below to stay in touch. We'll sign you up for our newsletter, which will inform you of the latest inventory and events at Talking Stick Resort Arena. We promise we will never sell or distribute your information. The seating chart below shows where the Phoenix Suns suites at Talking Stick Resort Arena are located.